Siemens 3-Pole Heavy-duty safety switch is rated at 600-Volts and 30-Amps. It features 3PDT contact configuration. 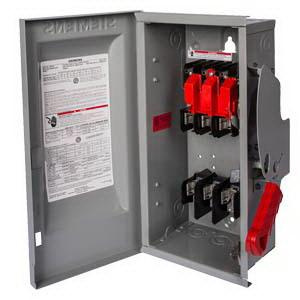 Non-fusible switch has 304 stainless steel housing to withstand daily wear and tear. It measures 17-Inch x 11.7-Inch x 8.1-Inch. This switch features double break visible blade design. It comes with highly visible ON/OFF indication for user convenience. Switch features front removable lugs that are easily convertible to copper body or compression type lugs. It involves quick-make and break switching action.